Director Joe Connor made a short film called Wait for Flaunt magazine which was shot in 8 minutes. For those interested, the music for the Daniel Radcliffe film was created by @sifinley of @SoundOfGunsUK next Trent? Update: 24th October 2013. Joe's Daily interview with Joe Connor below. And I re-tweeted Joe's tweet to danieljradcliffe.tk to share the video, feel free to do that also. 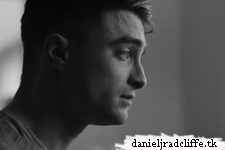 Wait : Daniel Radcliffe from Joe Connor on Vimeo. Joe’s Daily: Was it your first time working with Daniel? Joseph Connor: It was the first time I’d worked with him – first time I’d met him to be honest. He was completely relaxed about the whole process. He was busy shooting some of the amazing stills that went with the campaign for Flaunt (http://www.flaunt.com/people/daniel-radcliffe/) and they brought me in to shoot a short with him as I’ve worked a with a lot of British actors, we just grabbed a few minutes at the end to chat about some ideas. JD: Did Daniel have any input or let you direct him 100% from your own ideas? JC: The short came from a loose conversation we had about fear, that feeling that you are waiting for someone or something. Dan mentioned a few moments that this had happened to him and drew on that and then I just let him do his thing. We sort of played this very simple game between Dan and the camera and the action of looking – it was very simple which is how I like to work…. he’s such a skilled actor (It blew me away actually, how intense he can become) that after that initial conversation my only direction came through how I positioned the lens and he just reacted to it instinctively, giving me what I wanted. I’m a big fan of letting actors be, giving them small games to play and letting them stare into the lens if it feels natural and that final moment just grew organically and I think it shows in how honest that look is. JD: Why did you end up using black and white? Was it to go along with the old timey narration? JC: The black and white element actually came about because I wanted it to have a portrait feel. I was sort of thinking of ‘The Man Who Wasn’t There’ when I was cutting it for some reason and also I think it’s because ‘Wait’ is such an intimate character piece, a portrait of Dan that it just leant itself to being in black and white for me, it helped it to focus in on him and his performance. The narration actually came after, I found it and it just struck a chord with me – I’ve used this technique in some other films I’ve shot – I’ve got one with Aidan Turner that should be released some time in the next few months that has a similar vibe. I really like it as a technique – I studied mime and am a big lover of silent films, mainly for their honesty – this helps me to shoot silent films and tell quiet stories without depriving the viewer of a voice in their ear. Got to give a mention to the music which was composed by Simon Finley who is a good friend and an excellent composer – he really captured exactly what I was after and set the tone of the whole piece. JD: Where can we stalk you Joe?